Have you considered building a home, but reached the point of feeling somewhat overwhelmed with all the decisions and commitment required? How do you even go about choosing the right builder? Start by checking the reputation of builders in your area, and look at houses and communities they’ve built. Do they seem to have staying power, looking almost like new even several years after they were built? 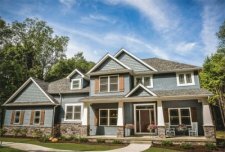 Selecting the right builder means finding someone who is ready and eager to guide you through the process. The right builder works with highly qualified contractors and vendors, using only top-quality items in the construction.And as a house, duplex or condominium unit ages, the quality shows. These issues have everything to do with a builder willing to stand behind its product, and even to offer warranty above and beyond that which may be required by state regulation. Pennsylvania state law, for example, mandates a structural warranty in home building. “In addition to the state-required 10-year structural warranty, we offer a two-year limited warranty, which is, say, a faucet leaking, or any type of minor item that may go wrong in the house,” said Dominic Maleno, who heads up Maleno Builders within the Maleno Real Estate Development organization.“We’ll go back for two years, and we’ll correct it. Sound, sturdy and weather-resistant foundations are critical for all structures, and it’s essential to find out what brand and specific material, style and type of foundation you’re getting. “In all aspects of the home, we’re teamed up with the right contractors and suppliers,” said Maleno, a past president of the Erie Builders Association and a Certified Green Builder. “The most important part of a home is the foundation it sits on.The entire structure is really only as good as the foundation. “That’s why we use precast concrete foundations from Superior Walls, which offers a 15-year warranty that we pass along to our customers. These foundations save enormously in construction time and cost because they’re erected on-site in one day.And right after that, we’re already framing up the house.” A home’s energy efficiency is another huge consideration. The return on a customer’s investment in an energy-efficient home becomes obvious every month in lower energy bills for heating and cooling. Those processes, in fact, extend to Maleno’s in-house design center, with a full-time on-staff designer to help guide you in selecting flooring material, lighting, cabinet styles and hardware, bathroom accouterments, plumbing fixtures, everything to truly make the house a custom-designed home of immense personal and family value. Selecting the right builder also extends to the plans themselves. What level of technology does a builder use in creating or modifying your house plans and layouts, such as computer-aided design, or CAD? It’s important that a builder is willing to work with you, to create a home that you design, and that suits not only your needs, but those of all the other members of your family. In summary, the major points of comparison in selecting a builder include quality, reputation, service and a willingness to stand by your side every step of theas well as follow-up) to deliver the home on time and on the budget.